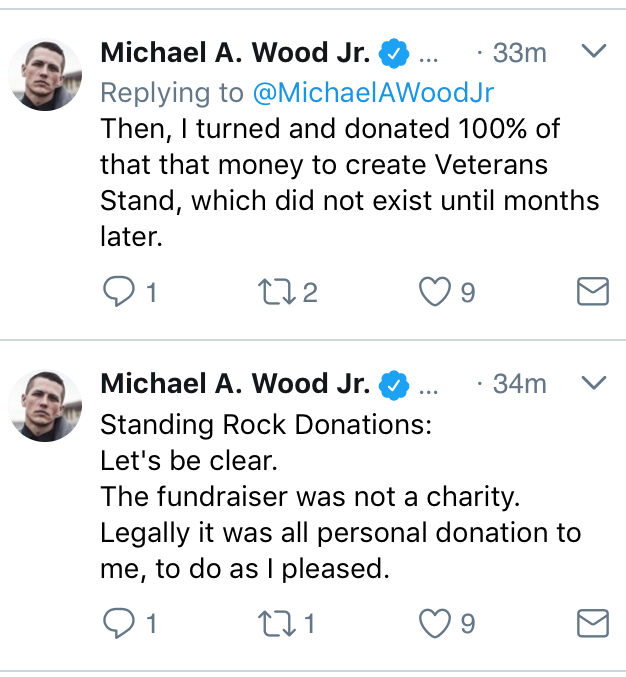 Note: Due to a reporting error, we erroneously claimed that Michael Wood, using donations to Veterans Stand, paid $65,000 to WorldViz for virtual reality services for the Vans Warped Tour in June 2017. We have verified that although Veterans Stand corresponded with WorldViz, no contract was signed and no payments were made. This story has been corrected. “The only way I’ll talk is if you sign over the rights to the interviews,” said Michael Wood. The 38-year-old activist slid a contract across the coffee shop table, complete with his aggressive, looping signature across the bottom of the page. It was just a few days before Christmas in Playa Vista, California. Wood wore gray sweatpants with one leg hiked up to his knee, exposing a muscular, almost hairless leg and ankle-high socks in black Nike slides. He wore his dirty-blond hair high and tight. A fireplace flickered, and a light breeze sent palm trees swaying. Wood, who is originally from the suburbs of Baltimore, worked as a cop for 11 years and became known for speaking out against police brutality on Twitter. He was frequently quoted by the media, describing systemic problems in policing, particularly inside the Baltimore Police Department, his former employer. 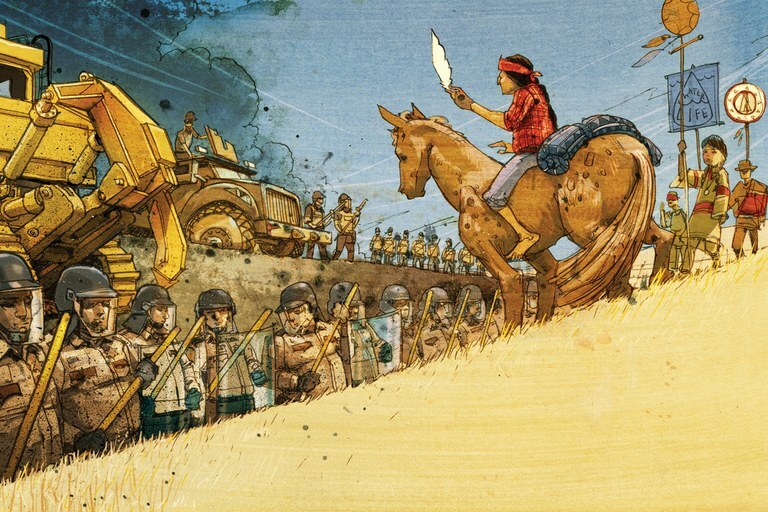 Today, Wood is perhaps better known for co-founding Veterans Stand for Standing Rock, a self-described “peaceful, unarmed militia” organized in 2016 to support Indigenous opposition to the Dakota Access Pipeline near the Standing Rock Indian Reservation. At the time, he said, it seemed like a good idea. He never thought that his pilgrimage to the wintry plains of North Dakota would ultimately derail his life and leave him at the center of an ethical controversy. Within one year, Wood helped create Veterans Stand and raise more than $1.4 million in online donations. But that money remains largely unaccounted for — and the organization has since collapsed. It’s highly irregular for a journalist’s source to demand exclusive rights to an interview. Wood already had been accused of misspending some of the money he raised and misleading donors in his work at Standing Rock. So that day, we agreed to talk off the record. In the course of a nine-month investigation, High Country News compiled publicly available data from GoFundMe and examined nearly 250 campaigns, each of which raised at least $3,000 for causes related to the Dakota Access Pipeline. Altogether, more than 138,000 people donated nearly $8 million. Many of those campaigns accepted money without necessarily offering accountability, either to their donors or to the causes they claimed to represent. In the case of Veterans Stand, chaos and disarray become the hallmarks of a campaign that initially galvanized thousands of veterans and inspired more than 26,000 people from around the world to donate. That money was, at best, squandered and at worst, egregiously misspent. Wesley Clark Jr., a 49-year-old Army vet with short dark hair and wide-set eyes, makes a lot of his friends on Twitter. His page bears a red-and-yellow sigil as his profile photo, strikingly similar to the Ferrari logo. Underneath it, in white all-capital letters, is the word VAMOS, Spanish for “let’s go.” He began following Michael Wood, intrigued by his police reform efforts, and then, in October 2016, met him in person on the California set of The Young Turks, a left-leaning video blog. Both vets cared about social justice issues, and they stayed in touch. A month later, Phyllis Young, an elder of the Standing Rock Sioux, asked Clark if he could use his connections with veterans to raise awareness of the struggle against the Dakota Access Pipeline. “It lit a fire in my heart,” Clark said. “This seemed like a chance to do a whole lot of good. But also, I was just shocked. As the summer wound on and I was following what was going on out there, I saw these people clearly being abused. And it wouldn’t have happened if they were white.” Clark’s first call was to Wood, who answered it sitting in his suburban Philadelphia basement. The #NoDAPL movement had begun earlier that year, in response to the proposed construction of a controversial oil pipeline near the Standing Rock Sioux Reservation in North Dakota. Even as the tribe and its allies fought the pipeline in court, a grassroots movement erupted on social media and drew a powerful response from across the country. Protesters converged on the area, and numerous groups and individuals began fundraising, ostensibly to support the “water protectors” on the ground. Veterans Stand was one of the hundreds of campaigns that started GoFundMe pages. But there were signs of trouble from the beginning. Clark, according to Wood and other Veterans Stand volunteers, did not take naturally to a leadership role, so Wood stepped in. But their duties were never clearly delineated. 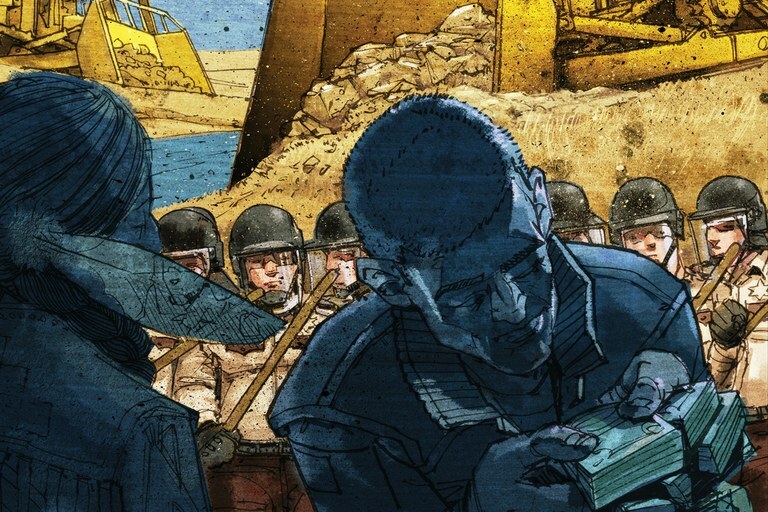 Wood still acted as if Clark were in charge of the mission, while Clark followed his lead and assumed Wood was taking care of crucial planning. Responsibilities fell through the cracks, from communicating changes in plans to volunteers to arranging to get supplies delivered to the #NoDAPL camps. They needed a place to communicate with volunteers, but Clark didn’t know how to create events on Facebook. So that job fell to Wood. When Clark didn’t answer his phone, which happened frequently, according to Wood, volunteers would call Wood instead. By Nov. 10, 2016, Wood and Clark had recruited a handful of volunteers. At Veterans Stand’s peak, some 20 volunteers were helping with general planning, logistics, safety, communication and money handling. Thousands of well-intentioned veterans made the journey to North Dakota. But throughout the organization’s rise and fall, only a small group — just five people — remained in crucial roles. Dispatching from her funky studio apartment in Santa Monica, California, Sedef Buyukataman was one of them. A tall and lean woman of Turkish descent with short curly brown hair, she was brought on board by Clark. She considered him a close friend, even though they had only met on Twitter a few months prior. She offered to help with social media and, because she had a background in corporate human resources, assist Wood and Clark with general planning. Chris Duesing, a tall, tired-looking man whose shaggy blond hair had long since outgrown his former military crew cut, handled travel logistics. Clark told me he felt uncomfortable linking his bank account to a GoFundMe page to raise money, so Wood set up the campaign’s page. But Clark’s name carried considerable clout; his father was a retired U.S. Army general who was active in politics, wrote several books, and campaigned unsuccessfully for the Democratic presidential nomination in 2004. The junior Clark’s face therefore initially appeared as the campaign organizer on the public donation page. The GoFundMe page went live on Nov. 11, with a $100,000 goal. As the fledgling campaign’s message began to spread, money trickled into Wood’s personal bank account. In North Dakota that November, as Veterans Stand was gaining momentum, thousands of protesters flocked to the demonstration. On Nov. 1, 2016, President Barack Obama announced that the U.S. Army Corps of Engineers was re-evaluating the pipeline plans to see whether it was possible to reroute it. “We’re going to let it play out for several more weeks and determine whether or not this can be resolved in a way that I think is properly attentive to the traditions of the first Americans,” Obama said. Meanwhile, Buyukataman and Duesing created a public Google spreadsheet that served as the roster for veterans interested in joining the demonstration. By Nov. 18, just a few days after the Veterans Stand campaign went live on GoFundMe, a few hundred supporters had signed on. At that point, the GoFundMe page had raised nearly $14,000 from 360 donors. Just five days later, it had raised nearly $114,000. The money was supposed to go toward food, transportation and supplies for any veterans who went to Standing Rock. Then the protests took a dramatic turn. On Nov. 21, the Morton County Sheriff’s Department clashed with the self-proclaimed water protectors at Backwater Bridge near the pipeline. Three hundred people were injured and 26 were hospitalized for injuries ranging from hypothermia — the police sprayed demonstrators with water cannons in freezing temperatures — to seizures, loss of consciousness and impaired vision from the impact of rubber bullets. According to protestors, one activist, New Yorker Sophia Wilansky, was injured by a concussion grenade, although local law enforcement has disputed this. Not since the American Indian Movement’s stand at Wounded Knee in 1973 had government hostility toward Indigenous people been so overt, and so violent. On Nov. 28, Wood increased the GoFundMe campaign goal to $750,000. “Everything exploded after that,” Buyukataman recalled. The roster rapidly filled. Hundreds of volunteers became a thousand, and many had questions that neither Wood nor the other organizers knew how to answer. Would food be provided? Was a ride-share arranged? How would donations cover costs? Wood and Buyukataman fielded hundreds of messages on Facebook, Twitter and the GoFundMe page. Wood, Clark, Buyukataman and Duesing scrambled to organize the thousands of volunteers, but between frantic phone calls, videoconferences and uncoordinated messaging, plans changed with the whims of whoever took charge that day. Despite the growing chaos, Wood was pleased; according to Buyukataman and other volunteers, he seemed to view the deluge of support as the only important barometer of success. The GoFundMe account was receiving donations at a terrifying speed. By Nov. 30, just four days before Veterans Stand’s planned deployment to Standing Rock, the group’s online donation page had raised $678,000. In response, Wood increased the campaign’s campaign goal from $750,000 to $1 million. On Dec. 4, 2016, Wood left Los Angeles for Bismarck. Already, more than 2,500 veterans had left for Standing Rock. They were scattered across the country. Even as money poured into Wood’s account, the logistical problems were compounded: Buses were stranded, drivers unpaid, veterans needed cash for gas. Volunteers ran late, and Clark could not be reached. As Wood’s plane pulled up to the gate, the GoFundMe campaign hit $1 million. By 10 a.m., he was at cruising altitude, hurtling toward North Dakota. Click to see the data from #NoDAPL projects on GoFundMe. Far from Standing Rock — through computers, cellphones and tablets — countless people donated to the #NoDAPL protests. Hidden among the idealists, however, were opportunists and con artists, eager to cash in on this explosion of benevolence. Crowd-funding sites like GoFundMe are a relatively new phenomenon. There are few regulations safeguarding people who give money to causes, however dubious. In fact, the site advises donors to “only donate to people you personally know and trust” — meaning that the donors themselves are considered accountable. While the platform allows people to report suspicious and possibly fraudulent campaigns, little public evidence exists that GoFundMe actively polices complaints. GoFundMe did not respond to HCN’s request for an interview. Some campaigns continued raising money well after the #NoDAPL camps were disbanded. Red Warrior Camp, which was ordered to decamp in early 2017 by the Standing Rock Sioux tribal council, continued to collect money. For seven months, the campaign collected funds to the tune of nearly $300,000, with the most recent donation given in July 2017. The campaign’s organizer, Tara Houska, the national campaigns director for the Indigenous-led environmental organization Honor the Earth, did not respond to multiple requests to be interviewed for this story. “It’s startling,” said Michael Johnson, assistant director of development for the Native American Rights Fund. The annual budget at his organization is about $10 million a year, with which the nonprofit maintains a legal fund to defend the rights of tribal nations and organizations. Donations to Veterans Stand, he said, represented “serious money that was generated to support the community and the protest actions that were happening at Standing Rock. And at the end of the day, these protesters left, and the community is left holding the bag — and the same underlying issues remain.” The Standing Rock Sioux did not respond to multiple requests for comment. When Michael Wood arrived at the Bismarck airport, the reality hit him. He saw large groups of veterans in their old uniforms and badges: Desert Storm, Vietnam, Afghanistan. They were everywhere, searching for outlets to charge cellphones, asking where the buses for Standing Rock were. There was camaraderie and a growing excitement as they discussed their shared mission. Wood, not in uniform, slid past unnoticed, toward the baggage claim. Once he retrieved his bag, Wood climbed into a rental car driven by Anthony Diggs, a homeless former Marine and volunteer from San Diego. Diggs, an olive-skinned 26-year-old with curly brown hair, talks quickly and at times incoherently. I spoke with Diggs recently, and he recalled running down the list of problems waiting for Wood: Veterans were not meeting at the designated check-in point in Eagle Butte, while volunteers were scattered from the Oceti Sakowin camp to the Prairie Knights Casino in Cannon Ball. There was a lot of miscommunication. People were stranded on the side of the road outside Bismarck, where yet another bus had broken down. Thousands of dollars worth of supplies had not been delivered to the post office box that, according to Wood, Clark failed to set up. On top of that, a blizzard was expected that night. The inside of the Prairie Knights Casino was a disorienting sight. In stark contrast to the blinking and bleeping of slot machines, the floors of the hotel and gaming area looked like a makeshift emergency shelter. As the weather became increasingly sinister and local law enforcement grew more aggressive, protesters fled the Oceti Sakowin camps and crowded in. Sleeping bags and canteens were piled in corners. Every available outlet was plugged with chargers. Wood hoped to find Clark and other volunteers for Veterans Stand. Instead, he met a new cast of opportunists and idealists rising through the ranks of his topsy-turvy outfit. Loreal Black Shawl, a 38-year-old woman of Oglala Lakota and Northern Arapaho descent, was recruited from the casino floor to be a spokeswoman for the group. A young, outgoing veteran herself, Black Shawl often wore square-framed glasses and a black ball cap with a feather and the words “Native Veteran” across the front. She joined at a particularly chaotic time. When Wood arrived, he found thousands of water protectors seeking shelter from the imminent blizzard and more than 2,500 veterans, who were ready for marching orders that hadn’t come. In the chaos, Wood managed to reconnect with Duesing. Buyukataman, however, was still en route to the casino with a busload of veterans. Wood abruptly decided to put Buyukataman, whom he knew as kind, calm and collected, in charge of handling all the reimbursements. In the meantime, Wood stationed himself by a payphone and began reimbursing veterans with what cash he was able to withdraw from his bank account. He was having problems accessing the GoFundMe money, and with nowhere to sleep, he curled up in the corner with a blanket, using his bag as a pillow. Buyukataman realized that no one had been using the roster to keep track of or reimburse the nearly 3,000 veterans who had signed up. Hundreds of people were unaccounted for, and Veterans Stand was supposed to be responsible for them. Meanwhile, Duesing and Pate Hutson, a Navy veteran from Upper Arlington, Ohio, struggled to bring order to the camps. Suddenly, uproarious cheering broke out: The Obama administration had denied a crucial easement for the pipeline. The Army Corps would have to halt construction and issue an environmental impact statement with “full public input and analysis” before it approved the river crossing at Lake Oahe. The water protectors had won a crucial battle. Buyukataman wondered how everyone would get home. How could they possibly keep track of reimbursements now? She was troubled to see a wave of disappointment ripple through the veterans; some had clearly come for a fight, and now they weren’t going to get one. Then, on Dec. 5, the blizzard hit. Temperatures hovered around 3 degrees Fahrenheit. Wind gusts hit 50 mph. Propane fuel gelled up in the cold, and an estimated 4,000 veterans organized by Veterans Stand were stranded, scattered across the plains, on the reservation and at the casino. That morning, Buyukataman was frantically stuffing thousands of receipts into envelopes, many with unintelligible names and addresses scribbled on them. Meanwhile, Clark finally emerged from his curious absence, appearing at a “healing ceremony” in the pavilion of the casino. The casino auditorium was filled with a mix of Standing Rock Sioux elders and tribal members, veterans and water protectors. The dozens of journalists who sat on the floor in the front row wielded cellphones and cameras as Clark spoke slowly into a microphone. “We stole minerals from your sacred hills,” Clark said as he knelt in front of a small group of Sioux spiritual leaders. “We didn’t respect you. We polluted your Earth; we’ve hurt you in so many ways. … We’ve come to say we’re sorry.” Wood and Buyukataman felt uncomfortable. They felt like Clark was drawing attention away from the moment, from the Standing Rock Sioux, and focusing it on himself. There were still hundreds of veterans unaccounted for, and the remaining campaign organizers scrambled to figure out how to get home. The deployment, they agreed, was crazy — far beyond anything that anybody had expected. But Veterans Stand had raised more than $1 million, and with that money, Wood, Buyukataman and Duesing believed they could turn the organization into something that could truly make a difference. When they got home, they planned to use the GoFundMe money to seed a nonprofit organization. Wood announced that he would be president, and Buyukataman readily signed on. “At that point, I wanted to make sure that everyone got the reimbursements that they were promised,” she told me. In February 2017, Buyukataman was still combing through the thousands of receipts left over from the December deployment. “I had processed all of the receipts — I had more than 1,700 receipts to contend with — and came up to about $7,000 that needed to be reimbursed,” Buyukataman said. “At that point, we really could have just finished it in a way that was right.” Clark had by then severed his connection with the campaign, but Wood continued to oversee the organization’s mission, along with Buyukataman, Duesing, Diggs and Michelle Panzironi, a volunteer based in New York. However, Buyukataman had begun to have serious reservations: There was no transparency, she felt, and there had been questionable uses of the money. Wood sent thousands of dollars to Loreal Black Shawl — who helped in December but then discontinued her service — without consulting the rest of the group. “He would just handle certain reimbursements without telling me, and it would be for a lot of money, without any accounting of what he was paying for,” Buyukataman said. She couldn’t keep track of the decisions made by the fledgling board of Veterans Stand, she said, and she often disagreed with the direction that Wood wanted to go. Despite his status as president, however, Wood maintains that he was merely a volunteer who never made key decisions. At one point, according to Buyukataman, Wood suggested they use part of the GoFundMe donations to set up a home office in Southern California, where he could live while running media operations. “We all just went along with it,” Buyukataman said. “Like, ‘Um, OK?’ We didn’t have much of a choice, really. If you disagreed with Michael, he would get upset and then just do whatever he wanted anyway.” Wood had taken on Diggs, who was then homeless in the LA area, as his personal protégé. Diggs could live in the condo, he said, and do important organization tasks. Wood said he hoped that Diggs would, in time, take his place as president of Veterans Stand. Veterans Stand had raised more than $1 million, but it is unclear how much of that was spent on actual organizational activities. 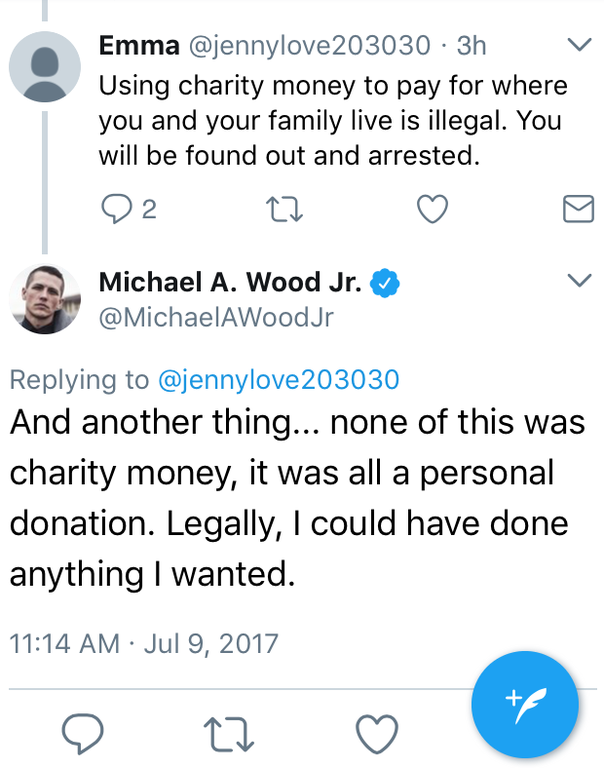 Wood attempted to reassure his donors on GoFundMe in January 2017: “Rest assured, your donations have been put to good use. We’ve bought countless supplies, winter gear, hotel rooms, trains, planes, automobile rentals and much more to help the vets make the journey and stay safe. I say ‘countless’ because we are still actively buying these things as we speak.” Still, he never gave a complete picture of how the money was spent. By February 2017, Veterans Stand had cobbled together bylaws for its board of directors and submitted nonprofit organization registration paperwork to the California attorney general’s office. With the chaos of Standing Rock behind it, Veterans Stand felt like its true mission was forming. On March 10, Wood and Diggs travelled to Washington, D.C., for a demonstration urging the public to support the water protectors and divest from banks that helped finance the Dakota Access Pipeline. 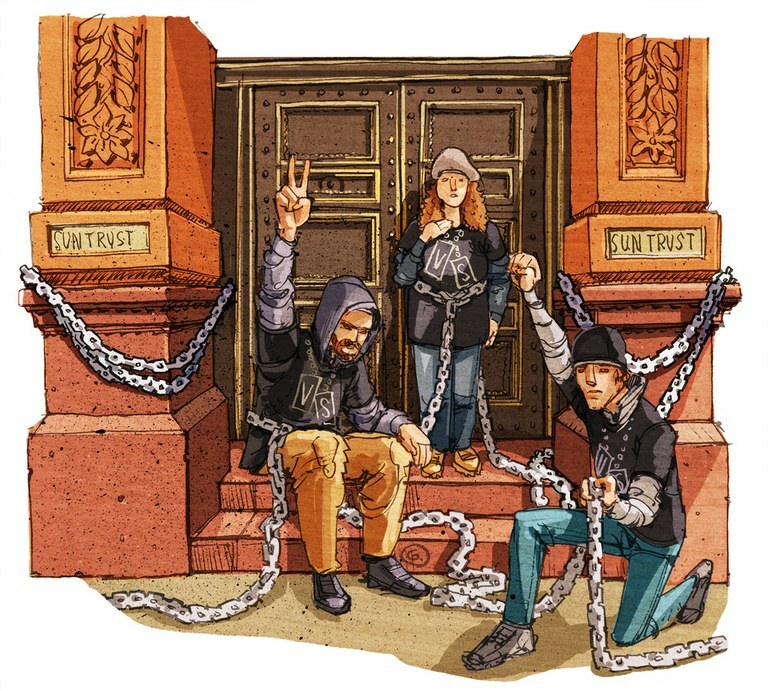 Buyukataman and Duesing, who travelled to the demonstration separately, told me that Wood and Diggs spent most of their time in a hotel room munching marijuana edibles — an allegation the two deny — before chaining themselves to the SunTrust Bank as part of the protest. Wood updated the organization’s GoFundMe page, stating that he had begun steps to operate the group as a registered 501(c)3. He created a website describing Veterans Stand as a “fully compliant 501(c)3”— a banner prominently displayed on the webpage. That winter, Wood created a second GoFundMe page, where an additional $280,000 was raised. My interviews with Wood, Diggs and other organization members left me uncertain about whether the group was, in fact, a 501(c)3 or a 501(c)4. In a formal information request to the Internal Revenue Service, however, I found out that it was neither: The organization never completed the registration paperwork. In fact, the group never responded to a follow-up request from the California attorney general for more information. Veterans Stand has not yet released an audit — and is unlikely to ever do so. The organization, which by then had raised just over $1.4 million, began to buckle. Despite the tumult of Veterans Stand, Duesing and Buyukataman sparked a romantic relationship and started their own organization:Veteran Service Corps (not to be confused with the Veterans Action Network), tasked with volunteering with the Cheyenne River Sioux. Duesing and Buyukataman pledged that their new organization would “protect and defend peaceful water protectors standing for their sacred land, civil liberties and clean water.” (Buyukataman recently resigned from the Veteran Service Corps.) According to Duesing, the new organization got no financial help from Veterans Stand. Hutson, who also returned home, got married and occasionally got involved with Duesing’s new venture. Michael Wood and Anthony Diggs were the last two volunteers remaining with Veterans Stand. They abandoned their original mission — helping the Standing Rock Sioux fight the Dakota Access Pipeline — and turned to broader activism for recovering veterans. To do that, Wood and Diggs went on the Vans Warped Tour, a popular punk-rock summer festival that tours the country. They set up a Veterans Stand booth promoting a virtual reality technology that was supposed to help returning war veterans cope with civilian life and the effects of PTSD. “I was just like, ‘What does this have to do with Standing Rock at all?’ ” Buyukataman said. “I don’t know in all honesty at that point what they thought they were doing, but they did nothing with that money to benefit the Standing Rock cause.” Members of Veterans Stand provided HCN with internal financial documents that reveal a range of questionable spending — including a number of transfers from the Veterans Stand account to personal bank accounts and a receipt for more than $500 to Ducati, an Italian motorcycle company. Wood claimed he “may have bought a helmet and forgot” and that additional bank statements were “stolen” by members of the group. The remaining receipts, he told me, don’t provide an accurate picture of the organization’s spending. As part of the Warped Tour, the two Veterans Stand members went to Albuquerque; Milwaukee, Wisconsin; Salt Lake City and Nashville. When they got to Kansas City, Wood’s relationship with Diggs began to dissolve. One disagreement led to another: Wood said Diggs hadn’t taken care of all the logistics needed to deal with the tour staff, and their virtual reality technology wasn’t making the splash they hoped for. So Diggs abandoned the tour. “Dude is a sociopath,” Diggs said of his former friend. Diggs returned to the streets of Southern California, where he had been homeless before and would be homeless again. 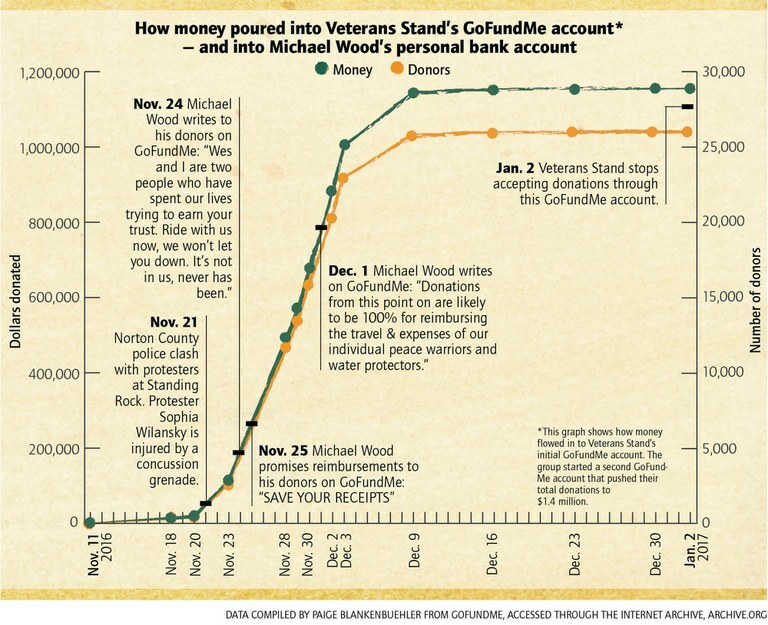 There is no way to know how much money Veterans Stand still has in its coffers; GoFundMe doesn’t release information about campaign funds, the funds were diverted into Wood’s bank account, and the organization never released an audit to the public or its many donors. Wood has claimed that he reimbursed 4,500 veterans — far more volunteers than ever signed onto the official roster — giving them $245 each. He also claims that 8 percent of the money went to various banking, money transfer and GoFundMe fees. Of course, neither the $60,000 for his condo nor the Vans Warped Tour were listed on the GoFundMe page, and for 10 months after Standing Rock, the organization masqueraded as a nonprofit despite failing to complete the necessary registration. Since Veteran Stand’s implosion, Buyukataman told me she’s filed complaints with both the IRS and the California attorney general’s office. There is no clear explanation of what happened to the $1.4 million that Veterans Stand raised, or who should be held responsible for how it was spent. Even though Wood was the organization’s president, controlled the funding, and was the only one who remained from start to finish, others were involved in the effort: Buyukataman, Duesing and Diggs. 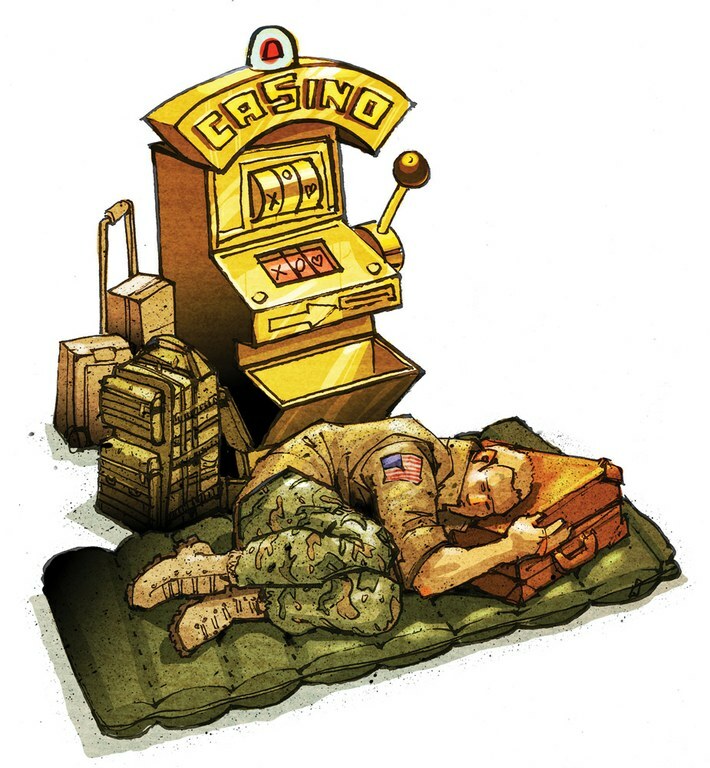 And even though it was clear to most of them that Veterans Stand was falling apart, they clearly outstayed their welcome — and did so on the tab of their unwitting donors. And they were far from the only crowd-funded “charities” that have failed to account for all the funds they received and spent. For this investigation, HCN dove into an $8-million sea of charities. Veterans Stand was just one of them. In March 2017, U.S. District Judge James Boasberg denied a motion by the Standing Rock Sioux and Cheyenne River Sioux tribes for a preliminary injunction against Energy Transfer Partners, L.P. — the company responsible for building the Dakota Access Pipeline. In his decision, Boasberg explained that the tribes would be unlikely to prevail in their lawsuit and denied their request to halt construction of the pipeline, or to stop oil from flowing through it once construction was completed. Today, Bakken oil flows through the pipeline, and Wood lives in a condo flanked by palm trees and luxury vehicles, financed by donations meant to help veterans and the Standing Rock Sioux. Help us investigate more stories like this. President Barack Obama on Nov. 1, 2016, announced that the Army Corps was reevalauting the path of the Dakota Access Pipeline, and he denied a crucial easement on Dec. 4, the same day that many Veteran Stand volunteers arrived, not the next day. This article has also been updated to include that 300 people were injured and 26 were hospitalized following a clash with the Morton County Sheriff’s Department, and that local law enforcement disputes the nature of Sophia Wilansky’s arm injury. Michael Wood moved to Playa Vista in the spring of 2017, and it was Anthony Diggs, not Wood, who eventually abandoned the Vans Warped Tour. Additionally, Wood arrived in Bismarck from Los Angeles, not Baltimore.